WINNER: Champions of Equality and Diversity Award at the Marketing Society Star Awards! To inspire and create a truly father-friendly world. A world where diversity is celebrated and the nurturing role of fathers is recognised and respected. 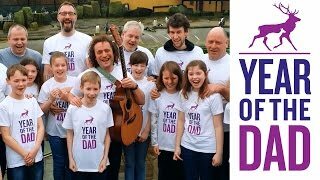 In 2016 we issued a rallying cry to make 2016 unforgettable as Year of the Dad - an award-winning celebration of fatherhood and the importance of fathers in child development and parenting. Thousands of you signed up to push forward this historic culture-shift, and the idea made ripples in both Scottish and UK Parliament, as well as scooping the PRCA DareAward.